JANE: I’ve spent the last week being alternately nervous and excited while I anticipated/dreaded what you’d want to say about my “Artemis Awakening” books. Let’s go for it! ALAN: The first thing that struck me about Artemis was just how well the history of the place was integrated into the story. The characters on the page are well aware that they are living at the end of a long span of time during which many complex things have happened, things that have shaped their own culture. We catch glimpses of this history as it pertains to the story that is being told, but there is obviously a lot more that we are not being told. So how much work did you put into the backstory before you first set pen to paper? JANE: I put in a fair amount of work, but less on a reasoned out “backstory” than on what sort of culture would have created Artemis and her inhabitants. So I don’t have an equivalent to the “Annals of Kings and Rulers” or whatever it was Tolkien put together, but I do have a very strong sense of the seegnur culture, both as it was at its prime and as it began to break down. The “whys” tend to fascinate me more than the nuts and bolt “hows,” and nuts and bolts interest me very little as such, which is why I took the seegnur’s technological developments in the direction I did – with technology tied to psionics, rather than circuit boards. 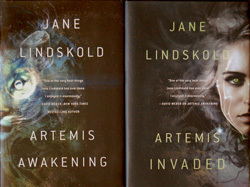 JANE: Adara has “cat’s eyes,” too… I thought the book cover for Artemis Invaded did those very well. I’m not sure the concepts are “novel,” but certainly in the majority of print SF I’ve read, if they are used, they are presented as “negative mutations” or results from attempts to create super soldiers or something. I want to stress print because humans with animal traits are more common in illustrated SF – and not only in the stuff for “kids,” either. The current graphic novel hit Saga does some brilliant work with blending human and animal characteristics. I guess I’m weird, but I’ve always thought such adaptations would be wonderful and exciting, so I decided that the seegnur who created Artemis would, too. One thing I’d like to stress… The “demiurge” relationship goes both ways. This isn’t a “wizard and familiar” thing. Sand Shadow is Adara’s demiurge, but Adara is Sand Shadow’s demiurge as well. In Artemis Invaded, they both are coming to terms with the fact that their relationship with the planet may be a variation on the demiurge relationship between humans and animals. Since there are indications that the relationship has physical, as well as mental, ramifications, this could be very interesting indeed. ALAN: Oh indeed – that comes across very clearly. JANE: Anyhow, since in the Firekeeper novels, I’d already “done” human/animal communication based around the idea that animals have language of sorts that humans can learn to speak, I wanted to do something different with the communication between humans and animals on Artemis. Since I already planned to use psionics, that was the natural route to take. However, I also try to make clear that this isn’t an instant “fix.” Adara and Sand Shadow are still working on building their own image-based language – one that bridges the differences in their sensory apparatus, life-experiences, and such. ALAN: And you also explore that same idea from the other side, as it were, when you show us the gradually evolving communication that Adara and Sand Shadow have with Artemis herself. Indeed, the whole structure of the story depends on (not always successful) communications of one sort and another. For example, vital plot points depend on decoding Ring’s often incoherent sentences, which are caused by the confusion of the ever-shifting probabilities that he sees as all the futures shift around him. Was this thematic choice a conscious decision or did it just arise by itself from the narrative structure? JANE: It rose from the narrative structure… I rarely impose a structure on a story. I let the story make up its own mind. By the way, I love Ring! I’m so glad you mentioned him. My own Oracle of Delphi. ALAN: Yes, he did seem somewhat oracular! In fact, you refer to a lot of Greek myths in the books, particularly with the naming of names. We’ve already met Artemis and Leto (and I kept looking for Artemis’ brother Apollo, but I haven’t found him yet). And Castor and Pollux appear as well, of course. Why did you do this? I really wanted to call the planet Artemis, but I had to wonder… Would the Greek myths survive that far into the future? I mean, back when I was teaching college, most of my students didn’t know who Apollo was, much less Artemis or Leto. So I considered and decided that in some contexts the Greek mythological figures would indeed be remembered – and one of the reasons would be because planets and other astronomical features keep getting named for them. This, in turn, would mean that variations of the myths would be included in Wikipedia and its descendants into the future. Castor and Pollux are named more for the constellation than for the warriors of myth. Griffin is named for a “historical” figure, not for the winged eagle/lion hybrid monster. Such little touches of world-building actually get me very jazzed. ALAN: And that’s why it feels so real. The devil is in the details and you’ve obviously put a lot of thought into those details; right down to the individual words themselves. Where did “seegnur” come from? Why is this important? I wanted to use a word that wasn’t English but that would have “echoes” to the ear of an English speaker. ALAN: And by putting all these things together, you really have managed to create that sense of wonder that is so important to a well-told science fiction story. So we come full circle. When we first started talking about this topic, I never realised that we’d have so much to say about it. Amazing, eh? JANE: Uh… Can I get away with saying “wonder”-ful? This entry was posted on September 3, 2015 at 1:00 am and is filed under Thursday Tangents. You can follow any responses to this entry through the RSS 2.0 feed. You can leave a response, or trackback from your own site. Both Artemis books are great science fiction. Hoping for more! Cordwainer Smith used human/animal characters in his Instrumentality stories, but came at it from the other side: animals given human form and characteristics. The C’ in “The Ballad of Lost C’Mell” is for cat, as one example. I must confess that at this remove I recall very little about the People, however. While the etymology was always, I thought, quite clear, I’ve always pronounced the “-gn-” in the Italian way, as a palatalized /n/, similar to the Spanish /ñ/. Which leads the mind to playing tricks: I could’ve sworn that in your reading you pronounced it that way, but I must have mentally made the substitution. I do like the way you coin words with meaning, such as /a-thanor/ for those without death. Not literal (e.g., /a-thanatos/), but close enough to see an etymology which feels real.